We had to go to London recently, and as we had Barley, our dog, with us we didn’t want to do the drive in one go, so we decided to break up the journey by staying in the Angel and Royal Hotel in Grantham. 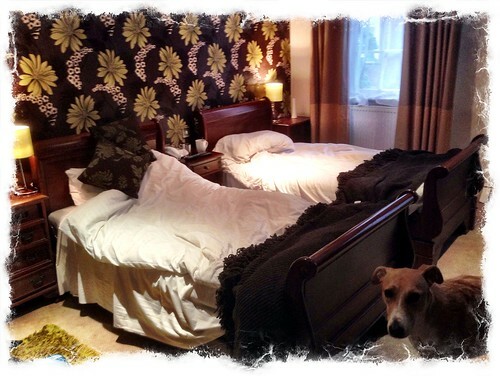 The main reason we chose the Angel and Royal Hotel was the fact that they welcome dogs. The fact that the Angel and Royal is an historic hotel, right in the centre of Grantham, and with ample parking was a bonus. For our first stay at the Angel and Royal Hotel we arrived at midday, check-in is usually at 2pm, so we were pleased to be given a room straight away. 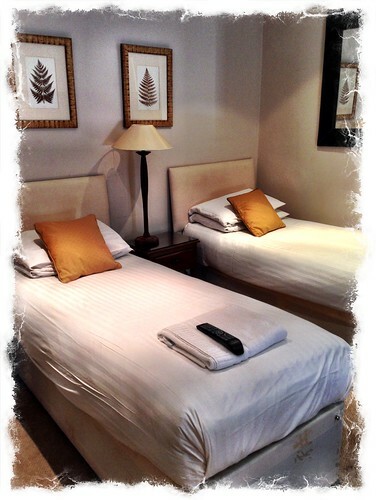 The room for our first stay was more like a mini-suite, it was well furnished and contemporary in style. There was a small lounge, and a small bedroom, both of which had a TV, and a nice bathroom. There was a kettle in the lounge with a few of sachets of coffee, a few teabags, one sachet of hot chocolate, a bottle of mineral water, and a couple of packets of biscuits. All of the rooms were nice and clean. The beds were quite small, narrow, but the mattresses were nice soft and comfortable. Unfortunately all of the rooms were very hot when we first arrived, and despite keeping all of the windows wide open all night, it was still too hot for us to get a decent nights sleep. Barley didn’t seem to notice the heat though, as he slept very well. Another issue was the shower, the water pressure was good and strong, which would have made showering a real pleasure. But the temperature of the hot water was so hot it was not possible to stand underneath it. It didn’t seem to make any difference how much we adjusted the taps, the water was boiling. During our first stay at the Angel and Royal Hotel the complimentary WiFi was a decent speed, so we were happy with that. The staff were welcoming and helpful. On our second stay at the Angel and Royal Hotel, a couple of days later on the drive back from London, we once again arrived at about midday. This time we were told our room would be available at 1pm. 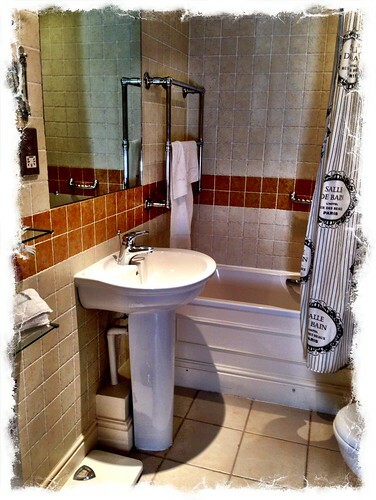 Once we checked-in we were given a standard room, which was larger than the room we’d had on our previous stay. This time the beds were a little bit wider, but the mattresses were very thin, hard, and uncomfortable. Also the wooden bed frames made really loud creaking noises every time we moved, which was disturbing. Thankfully the room wasn’t hot like the last room was, which we were pleased about at first, but by the evening it wasn’t pleasant, the room was very cold. Only one of the two windows shut properly, which obviously meant the room remained cold all night. This room was not as clean as our previous room had been, I’m not sure if the cleaner had completely finished preparing the room before we checked-in. There was a used bath towel chucked on the towel rail in the bathroom. The loo had poo around the rim of the bowl. 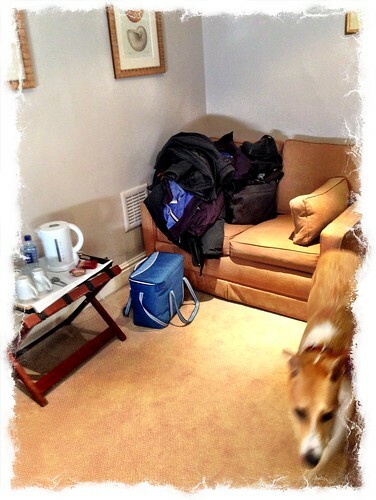 This room also had a kettle, and coffee, tea, and hot chocolate, but there was no mineral water, and no biscuits. Not that we particularly wanted them. The WiFi didn’t work at all in this room, which was very disappointing. Having said all of that, we did enjoy our stay at the Angel and Royal Hotel, it is a nice place in a good location, and we would stay there again. 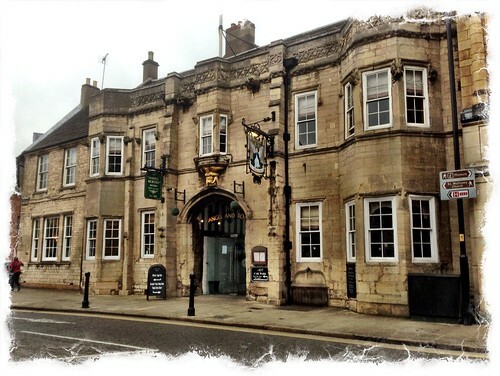 “In 1812, Lord Brownlow sold his property in Grantham to William Manners, including another pub, The Angel Inn, which had taken its name from stone carvings of angels on the front of the building. The gateway arch of the Angel Inn, as it stood in the 19th century, was older than the rest of the front of the building. On either side of the arch were carved heads of Edward the Third and of Queen Philippa his consort. These, with an oriel window above, can still be seen today. 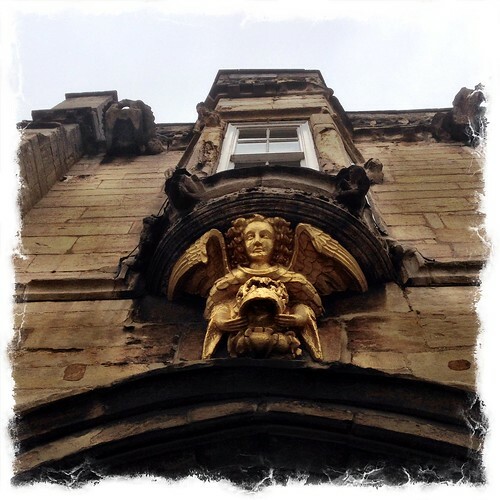 Also still to be seen today is the gold-painted carved wooden figure of an angel over the entrance, beneath the oriel. Such a wooden figure, dating as it does to earlier than the seventeenth century, is rare for an inn. The entrance dates to the Tudor period, as do portions of the courtyard buildings. Other rarities to have survived in the Inn include the stone twin-panel vaulting in the interior ceilings of the bay windows. The front of the building is built in ashlar, of local oolithic stone. The Angel thus lays claim to being the oldest surviving Inn in England, sitting on what was once the Great North Road. 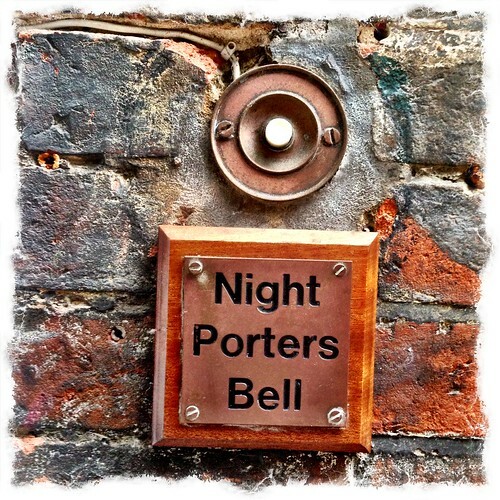 It is widely held that the Angel Inn was once a “commandery of the Knights Templar” (as reported in both White’s 1846 History, gazetteer, and directory of Leicestershire and Allen’s 1834 History of the county of Lincoln). However, the Reverend B. Street, curate of Grantham, stated in 1857 after his own investigations that “such is not the case”. “I have read a document drawn up at Grantham, October 15, 1291,” he wrote, “which certainly refers to the property, as belonging to the Knights Templars, but not as being a Preceptory of the Order.”. The King is about to proceed to parts beyond the seas for a short time. During his absence, he wishes certain matters relative to the peace of the kingdom to be explained to the Sheriff in a writ which the Sheriff will shortly receive. The Sheriff of Lincolnshire is therefore commanded to warn twelve discreet and trustworthy men, Knights or others, upon whose fidelity he can best rely, to meet him at Lincoln, on the 7th of January 1308, very early in the mornin; at which place and time the Sheriff is to be in person to do and perform what shall be contained in the said write, and also what he shall be directed to do by the bearer of it. On Wednesday, 10th January, 1308, very early in the morning, the Sheriff of Lincoln, with the twelve men summoned and sworn, is to attach and arrest all the Knights Templars in his Bailiwick. All their lands, goods, tenements, chattels, charters, writings, and muniments, are to be seized and secured, and an inventory of them made, in the presence of the Custos of the Templar’s house, and two witnesses. The Knights are to be kept in safe custody, but not in a straight or loathsome prison; and to be maintained out of the revenues of the Order. Street believes that the Angel Inn, having been seized by the king, probably then became the property of the Knights Hospitallers. He bases this conclusion on the presence of the arms of the Hospitallers on the East window of Grantham church in 1662 (as recorded by Gervase Holles in Notes of Arms in Grantham Church, a manuscript held in the British Museum), in place of the arms of the Templars that had been there, indicating that the Templars’ property in Grantham had passed to the Hospitallers. Street also records the Angel Inn as having been used to hold court by Kings John (on 23 February 1213) and Richard the Third (on 19 October 1483). He also states that it was probably used by King Charles the First on 17 May 1622. At the time of Richard III, the large room over the gateway of the Angel Inn was called La Chambre le Roi (the King’s Chamber). Street concluded that this room’s name came from Norman French, and probably from the visit to Grantham that John paid in 1213 (during which he delvered Letters Patent at Grantham granting the release of Lucian of Arquill). The evidence for Richard III’s visit he took from Rymer’s Fædera, as quoted in Halstead’s History of Richard the Third, which said that the Great Seal, used for issuing a death warrant, was delivered to the king by messenger “in a chamber called the King’s chamber in the Angel Inn, in the presence of the Bishops of Worcester, Durham, St David’s, and St Asaph, and of the Earls of Northumberland and Huntingdon, and of Sir Thomas Stanley”. This entry was posted in Hotel Reviews, Our travels in England and tagged Angel and Royal Hotel, Grantham, Travel on May 3, 2014 by Richard.